Plume is an atypical Washington DC restaurant. Part of it is that Plume’s interior feels more like Paris…or perhaps New York. Part of it is that Plume has aspirations – and an inventiveness – that are atypical of even some of DC’s best. And while “flawed masterpiece” may not be an epithet atypical of DC restaurants there are few described as such in part because of those aspirations and inventiveness rather than for their absence. Plume’s chef, Christopher Jakubiec – who may be familiar to San Diegans as the former Chef de Cuisine at Quarter Kitchen – has an ingredient-driven sensibility that focuses on the glory of the foodstuffs rather than the showiness of the techniques. At times, he succeeds spectacularly. At times you can see there from here. 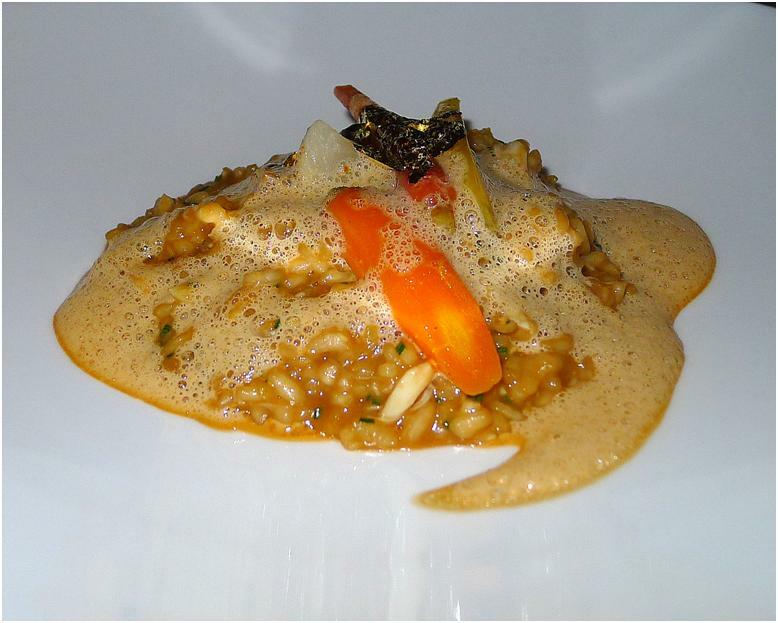 One of the first dishes we had – the Maryland Blue Crab Risotto – was a revelation. I cannot say that I have had a better dish anywhere…ever. In the classic, Venetian risotto style – one that is utterly unlike the general American perception of risotto – it was a rice dish first and foremost. Each grain possessed integrity and yet had a creamy quality, as well. The Maryland blue crab had a sweetness that did not dominate but featured, on the one hand, and offered an underlying note that ennobled the entire dish. The crab emulsion lent it a light, airy quality but also served the function of a subtly caressing ostinato bass…the gold leaf, more than a hint of luxury. It was a terrific dish. It was, we were quite sure, something that would be hard to top. We were right. Our other appetizer was a Hamachi Tataki with Garnish Four Ways. It was a perfectly prepared Hamachi Tataki with the exterior of the yellowtail encrusted with Togarishi spices. The dish was presented with four separate garnishes, two sauces (one soy-based, one ginger-based), wasabi, and utterly delicious perfect cylinders of pickled daikon radish that had an exquisite balance of sour and sweet. There was absolutely nothing wrong with the dish. It was delicious. And yet it simply did not offer the creativity, and breathtaking revelations of the risotto dish. The Truffled Avian Poularde dish was, perhaps, the more successful of our two main courses. The dark meat, in particular, was perfectly done….with an almost confit-like succulence. Both the potato bon bons and the baby leeks were perfectly prepared accompaniments that played off nicely against the fowl meat. But the white meat was ever-so-slightly – and it was not by much at all – overdone. And, to be honest, there just were no fireworks. If we were looking for fireworks we found them in the Bacon-wrapped Monkfish dish. As I have said before – including at Special Delivery in developing a meal that will feature in a future article in these pages – bacon makes everything better. It makes eggs better. It makes spinach better. It even makes cupcakes better. And on the list of things it makes better, fish has got to be up there near the top. 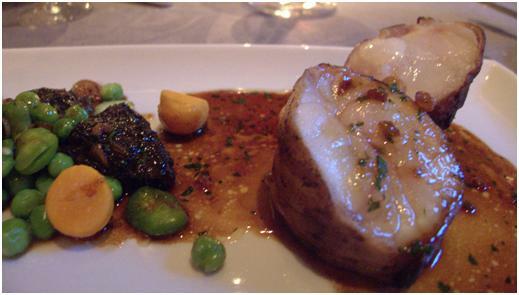 And as good as the monkfish was in this dish (and it was perfectly cooked)…I was happy for every bit of bacon I got. If anything, in fact, the bacon to monkfish ratio was a bit too far on the low side. The pea and fava bean garnishes were wonderful; I love both, both were perfectly prepared, and I loved having them on the same plate. The morels, however, were an off note. They were, however, filled with an overly rich puree that was of indeterminate vegetal origin; was this the sad fate of the ramps, advertised on the menu, that I could not find elsewhere on the plate? If so, both that filling and the morels’ earthiness were off-notes that were out of kilter with anything else on the plate. Similarly – and equally sadly – the sauce was overly rich and utterly failed to bring the entire dish together. This, unfortunately, was a dish that shot for the moon but crashed before leaving earth’s atmosphere. Instead of a dessert course, we took a cheese course. 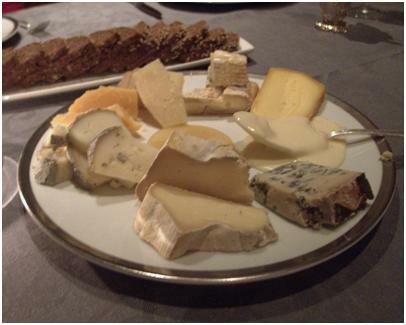 The desserts – spectacular as the might have been – could not have been better than the cheese course we received. Plume offers a remarkable variety of cheeses of nearly every stripe – runny, semi-soft and hard, cheddars, double cream, goat and sheep and domestic and well as imported. There was not a less-than-great one in the bunch. The only off note was the waiter’s lack of anything beyond a superficial “knowledge” of the cheeses. Frankly, of the servers, only the Sommelier was anywhere close to good…and the Sommelier was very good. The wine list was broad and deep, and the wines we tasted – even though they were of the unfancied varieties – were quite spectacular…particularly, the 2008 Stadt Krems Gruner Veltliner Weinzierlberg Kremstal, an Austrian white wine that paired brilliantly with our first course. At the end of the day, we left Plume happy we’d come. There were problems – similar, I might add, to some we’d found at Quarter Kitchen. But there was also quite a lot to be liked…and at least one spectacular dish that has forced us to find a different way to prepare risotto ourselves. We spent a lot of time after the meal discussing it. It was, it seems, compelling. I would like to ask you and know how did you use the word compelling, as an adjectiv or verb. Your description was great yet confusing or incomplete as the bacon wrapped monk fish ratio must be accounted with the temperature of the fish and covering the filet with too much bacon it would not be a well presented dish and would force one to use a different knife rather than one made for fish only. The wine was chosen by the sommelier,recommended or the selection was your choice? Did you used butter honey seeds of any kind or fruits with your cheese and wine selection and if yes, please compliment your experience. I’m not sure how I went about choosing the word “compelling” — but it seemed an apt word to describe the impact of a dish that had us discussing it hours later. Regarding the bacon-monkfish ratio you are correct in one way and missing a point in another. Certainly you are correct that use of a greater thickness of bacon relative to the same size monkfish might have caused a problem…but the same amount of bacon could have been used with less monkfish. 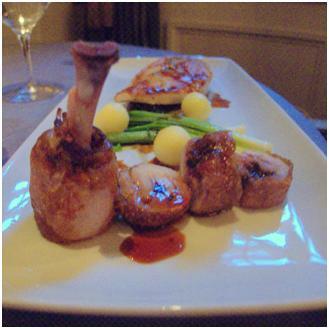 Alternatively, there’s nothing wrong with serving bacon-wrapped monkfish with a steak knife! The choice of wines was, in a sense, collaborative. I asked the sommelier about certain wines and he gave me more information about them. It is an excellent wine list and the sommelier is quite knowledgeable. I don’t recall using butter honey seeds or fruits with the wines.